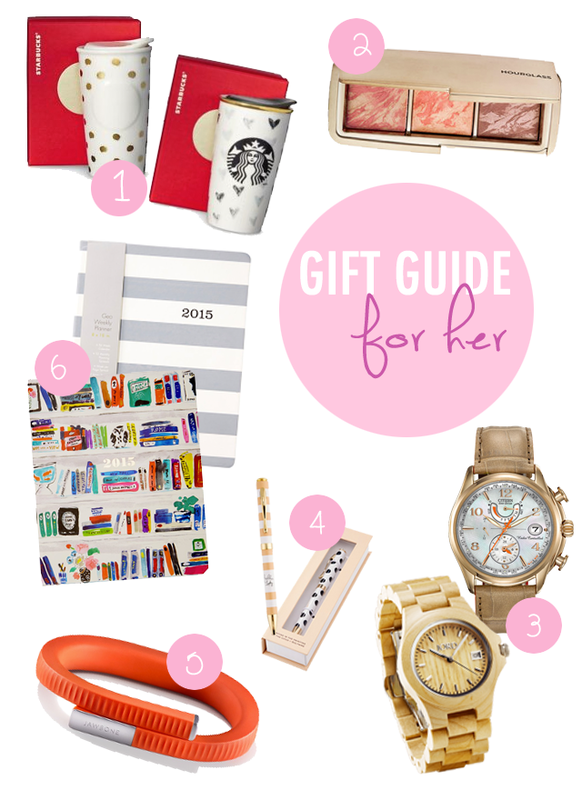 Hello fellow last minute shoppers—if you're like me and still wondering what special something to get for someone in your life, here are a few quick and easy gift ideas. How adorable is the new holiday collection from Starbucks? They have tons of cute (limited edition) designs for tumblers, cold cups, and mugs. My favourites are the Gold Dot and Black Hearts ceramic tumblers. Unfortunately, these guys are both sold out online… but you may still be able to find it in stores! Don’t forget to check out Target… their Starbucks Stores also carry selected items from the Dot Collection. It also pays to be a last minute shopper because the Dot Collection is on major discount right now on Starbuck.ca! If it's too late for that... Try a gift card! Who doesn't want a free latte to warm up this season? Blush is my favourite beauty product, so it’s no surprise that I would recommend the Hourglass Ambient Lighting Blush Palette. Funnily enough, I do not own this… There’s a good reason, I promise. I passed on this palette mainly because I own both of the permanent shades in this palette, so I didn’t want to neglect them & buy this palette unnecessarily. I will say though that the formulation of these blushes is so silky and smooth and long-wearing. Don’t get too hung up on the veining, just be sure to give your brush a good swirl in the product. Give them a swatch, I promise, they’re good. I love watches! Even though I bring my phone everywhere and I could just as easily check the time on it, there’s just something so satisfying about wearing a watch. I actually feel naked without one on. The Citizen Eco-Drive World Time A-T is the watch I’ve been wearing and loving for pretty much the last year & I adore it! It doesn’t require batteries—all it needs is sunlight. It’s radio controlled, so it pretty much keeps the time for you (literally), you never have to adjust the time. The Jord Ely watch is an elegantly understated time piece. Plus, it’s made of wood! Yes, it’s a wood watch. Pretty cool, right? I love that’s it has a slim (more feminine) design. They’re splash resistant, but like most things, are not meant to be submerged in water (especially for long periods of time). I love a good pen. I always carry a pen around with me in my handbag, so why not have a really cute one for others to ooh and awe over? Chapters / Indigo is my go-to for unique (and adorable) stationery sets… they rarely disappoint. These pens come prepackaged in ready-to-gift boxes and also have the most charming designs. One is a black & white polka dot with “hello” scribbled on it (here), while the other is a striped design with “hello lovely” in cursive writing (here). They’re perfect to keep in our purse for signing important documents, or to clip into an equally adorable agenda. You don’t really need to be a health fanatic to appreciate this gift, but it sure does help. The UP24 is wearable technology (at it’s simplest). It keeps track of your steps, activities, and sleep. I wear mine everyday, all day. It wirelessly connects to your smartphone and give you real-time updates throughout the day. Persimmon is my colour of choice, although be warned… it does show stains easily. I love the feel of a new agenda. There’s something exciting about getting a fresh one for a new year. Again, Chapters is always my go-to for agendas… they stock the cutest ones! I’ve been using the Kate Spade Agenda for the last couple of years and I really like them. The design are always adorable and they have a functional layout—I typically keep this one at work to jot stuff down in. If you’re looking for a simpler design, you could try this one from Eccolo. The stripes are classic and again, the layout is practical for everyday use. 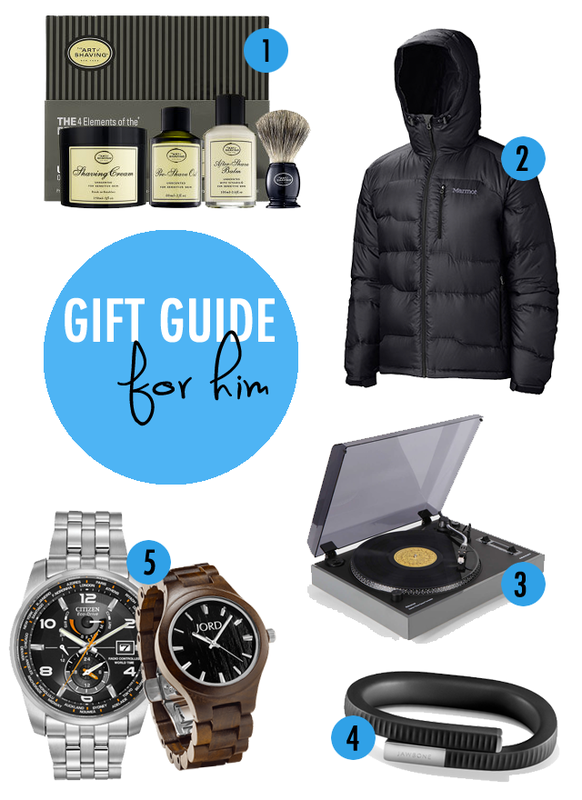 The men in our life love a little pampering, too! Especially when they’re shaving. This set from the Art of Shaving will help your guy (or any guy in your life) get that perfect clean shave. It comes with a pre-shave oil, shaving cream, after-shave balm, and a shaving brush. If you’re beau is looking for a lightweight, yet warm jacket for the winter season, then try the Marmot Ama Dablam Jacket. They have an 800 down fill (i.e., super warm) but it doesn’t feel heavy to wear. If your guy likes to stay toasty but still wants the mobility to lay their arms flat against their side, then this the coat for him. Vinyl is coming back in a big way. The Crosley Vinyl Record Player has a vintage-inspired turntable that actually has the capability to fine-tune the audio from vinyl records with strobe & pitch control. Pair this with a couple of his favourite vinyls and you’re set. Urban Outfitters has some cool ones. Not just for the ladies, the UP24 band is great for guys, too! Get one for yourself and your guy so you two can stay up-to-date with each other’s goals and also motivate each other if to maintain a more healthy lifestyle. What's on your holiday wish list? I don't really have anything particular in mind, but I do love surprises. My boyfriend actually got me one of the special edition mugs for xmas! I'm in love with it :) I don't dare take it out of the house though, too scared I might break it lol. It is amazing! I totally love the idea! Thanks so much for sharing!